Black and green Harvil RM-1 is a hydraulic rowing machine that was released and first appeared at Amazon.com in November 2017. It has a compact and space saving design with foldable full range motion arms. It is a well-constructed machine that you and people in your house can use every day without any problems. It is a very recent release product without many customer reviews online but scores 4.6 out of 5 stars at the moment. Harvil is designed as a low impact workout machine that will be much less of a burden on your knees, joints, and back. The smart easy to read LCD monitor gives you the standard useful indicators like elapsed time, calories burned, count (strokes you take), total count (accumulated strokes) and scan (shows each workout metric every six seconds). You can customize your exercise session, keep track of your progress and work towards achieving your goal. It has a sturdy and durable 35.4-inch steel frame that can have a total user weight of up to 265 pounds. The rowing machine weighs around 34 pounds and measures 50 x 36.2 x 20 inches. The large fixed pivoting footplates just below the LCD display has an anti-slip surface, will fit pretty much any foot size and includes safety straps. It has an ergonomic design with a molded seat that appears to be moderately comfortable but very durable and glides smoothly on the steel frame. All the parts of the rower are shipped swiftly by Dazadi via Amazon.com and without any damage or defects. Harvil brand is owned by Dazadi that has some great fitness products for home gym use. And if you receive any broken or defective parts they will replace it at no cost to you. 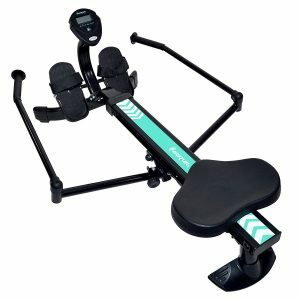 This is a great little space saving rowing machine with adjustable hydraulic resistance, foldable full range motion arms, a solid steel frame, a molded seat, large footplates, and a functional LCD display. You’ll need 1 x AA battery for the LCD monitor as it is not included in the box. It is easy to put together with the assembly video on the Amazon.com product page. Please note that rowing exercises do and will strengthen your back and will help alleviate lower back pain. The compact size and space saving design will be especially good for those that live in smaller apartments. The seat can be a little uncomfortable after half an hour or so and you may also want to invest in a seat cover. Your body weight drives the legs and the adjustable hydraulic resistance is for the tension on your arms. You can adjust the resistance through the manual control knob underneath according to what you can handle or how much you want to push on the day. It is not an expensive product for its build quality and features and offers an outstanding value for money.